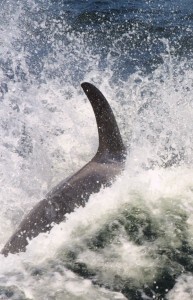 When is a medical intervention appropriate for a sick or ailing killer whale? It’s a complicated question, as I learned by interviewing a variety of experts in a two-part series just published in the Encyclopedia of Puget Sound. One aspect of the story that I found interesting was how a simple tree branch helped to make a connection between humans and a lonely orca named Springer. If you have read my story, you might be interested in how the stick played an ongoing role after the rescue. Springer, the killer whale, has borne a second calf some 15 years after she was rescued as a young orphan swimming alone near Vashon Island in Puget Sound. Springer with her new calf in Canadian waters. Springer’s rescue and return to her family in British Columbia is one of the all-time-great orca stories. It was a privilege to be a news reporter in 2001 when I was able to break the news of the lonely orca and follow the rescue effort in Puget Sound. After Springer was found swimming dangerously close to the Vashon-Fauntleroy ferry lanes, officials with NOAA Fisheries and other organizations put together a rescue plan. The young animal was identified as a member of the Northern Resident killer whales, a group that never comes as far south as Puget Sound. Experts believe that Springer’s mother had died and the young animal wandered all the way to Puget Sound. Springer was captured and placed under medical care at NOAA’s Manchester Lab in South Kitsap. She gained weight and became healthier before she was moved by jet catamaran some 300 miles north to Telegraph Cove near the northern end of Vancouver Island, B.C. After her release, she was soon reunited with other members of her family, as later described in a NOAA video (posted on this page). Orphan Orca, Saving Springer from NOAA Fisheries on Vimeo. 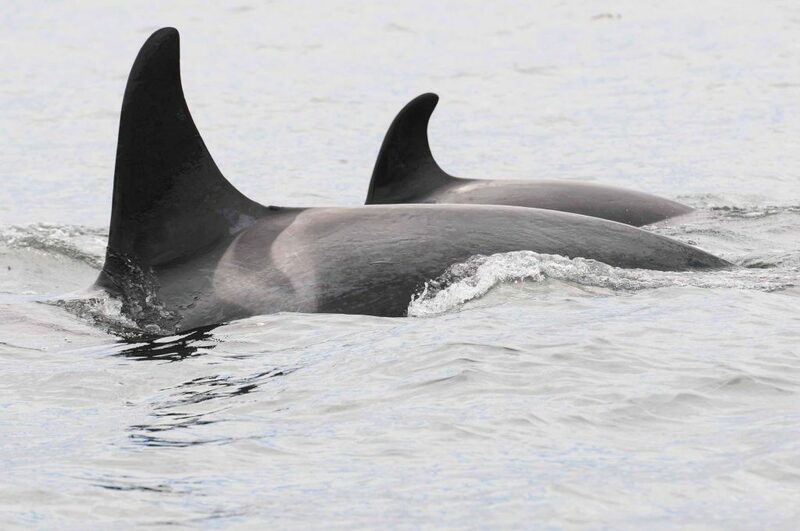 Springer’s newest calf was spotted June 5 by folks at CetaceaLab on B.C.’s north central coast. The birth was confirmed by Canada’s Department of Fisheries and Oceans. Springer and her first calf Spirit, born in 2013, remain healthy, observers say. They are most often seen in northern British Columbia, visiting Johnstone Strait at times during in the summer. News of the new birth comes just in time for the 15th anniversary celebration of Springer’s rescue. The event, called “Celebrate Springer,” will be held next weekend in Telegraph Cove. The public is invited to the festivities, including a slide show, “Springer’s Story,” Saturday at 11 a.m. featuring members of Springer’s rescue team. A panel discussion will follow. A new Telegraph Cove Whale Trail sign will be dedicated at 4 p.m., followed by a salmon dinner on the boardwalk at 5:30 p.m.
Lynne Barre of NOAA’s regional office in Seattle said partnerships developed during Springer’s rescue are enduring and demonstrate how federal agencies can work with state, tribal and nonprofit groups to help both Northern and Southern Resident killer whales. “The Springer success story continues to be an inspiration for all of us working on conservation in the Salish Sea,” Barre said. For additional information, check out the Springer Facebook page. As much as Springer’s story is one of cooperation and success, her rescue will always be linked in my mind to the tragic death of Luna, another young orca who was orphaned at the same time. Springer, as we’ve said, was born among the Northern Resident killer whales, which stay mostly in northern British Columbia. At the same time that Springer was lost and alone in Puget Sound, Luna, a Southern Resident, was lost and alone in Nootka Sound on the West Coast of Vancouver Island. In fact, my initial report on the situation featured both young orcas in a front-page story in the Kitsap Sun. The coincidence of two orphans at once is next to unbelievable, considering that orphan killer whales are practically unheard of. Luna never made it back to his family. He eventually died after being sucked into the propeller of a powerful tugboat. Before Luna’s death, Parfit wrote about Lunda for Smithsonian magazine. It was a story that I had pieced together over several weeks as a series of newspaper stories. Mike and Suzanne stayed around Nootka Sound to obtain a fuller story for their film. The greatest lesson from the Luna story may be similar to the one we learned from Springer, that cooperation is the key and that every detail must be considered before the rescue begins. From killer whales to native plants, it’s a potpourri of activities and events I would like to share with you. June is Orca Month. But first, on Saturday, we can celebrate the 15th anniversary of the remarkable rescue of a young killer whale named Springer. Also coming in June are gatherings small and large, including a water-based festival in Silverdale later in the month. This Saturday, May 20, folks will come together to celebrate Springer — the lost baby orca who was rescued and returned to her home in British Columbia. The 15th anniversary of the rescue will be commemorated on Vashon Island, at the Vashon Theatre, 17723 Vashon Highway SW. The celebration will include stories recounting the event, starting when Springer was found alone near the Seattle-Vashon Island ferry lanes and continuing through her return to the north end of Vancouver Island after being restored to good health. The celebration will include dancing by the Le-La-La Dance Group. These are the First Nations dancers who welcomed Springer back to her home waters 15 years ago. For details, check out the web site of The Whale Trail, which is sponsoring the celebration, which I wrote about in Water Ways on the 10th anniversary of the rescue. The kickoff of Orca Month will include a tribute to Granny, the elderly matriarch who led J pod for decades until her death this past year. The opening event, sponsored by Orca Salmon Alliance, will be Sunday, June 4, at Golden Gardens Bathhouse in Seattle. RSVP on the Orca Month Facebook page. If you would like to immerse yourself in information about the Southern Resident killer whales, you may enjoy the annual “Orcas in Our Midst” workshop on Whidbey Island on Saturday, June 10. Speakers will include Howard Garrett of Orca Network discussing the status of the Southern Residents, Mike Ford of NOAA talking about killer whale genetics, and Jacques White of Long Live the Kings addressing the critical Salish Sea Salmon. For details and reservations, visit the Orca Network website. Other events during Orca Month include a screening of the film “The Unknown Sea” in Burien on June 1, naturalists in the parks on June 3, “Day of the Orca” in Port Townsend on June 3, beach cleanups on June 13, Orca Sing on San Juan Island on June 24, and Orca Awareness Weekend at Seattle Aquarium on June 24 and 25. All events, including those in Oregon and British Columbia are featured on the Orca Awareness Month webpage. I didn’t realize until this morning that the YouTube video I posted contained only about a fourth of the original half-hour “Orphan Orca: Saving Springer” program. I’ve replaced it with the full version I found on Vimeo. Sorry for the oversight. A celebration of Springer’s dramatic rescue, which began 10 years ago this week, will be held a week from Saturday, June 23, at Seattle’s Alki Bathhouse. Springer, of course, is the female orca who was captured near the Seattle-Vashon ferry lanes, moved to Manchester for a time and then reunited with her extended family near the north end of Vancouver Island. See Kitsap Sun, June 12, 2002, and watch the video on this page, which was produced by the National Oceanic and Atmospheric Administration. Sandstrom is organizing Seattle’s free event, which will feature a welcome dance by the Duwamish Tribe’s Singing Feet dancers. A celebration in Telegraph Cove, where Springer was released in 2002, is scheduled for July 12 to 15. On Tuesday, a celebration was held at Vancouver Aquarium. For information, check the “Celebrate Springer” Facebook page or The Whale Trail website. It is believed that 2-year-old Springer strayed into Puget Sound, far from her home waters, after her mother died. Remarkably, it was at the same time that Luna, a 2-year-old male orca from the Southern Resident pods, was found in Nootka Sound on the West Coast of Vancouver Island. After I broke the news of these two young whales in foreign waters, the unusual circumstances drew international attention. A rescue for Luna was never completed, and he was tragically killed by a propeller of a large boat three years later. Springer was taken back into her pod, and it appears she was watched over by her aunt. Springer’s story continues, and researchers are waiting for the day she is observed with her own young calf. “The Whale” can now be seen at Lynwood Theatre on Bainbridge Island and will be screened next weekend at Clyde Theatre on Whidbey Island, the latter a benefit for Orca Network. “The Whale,” a long-awaited movie about a young Puget Sound orca named Luna, opened yesterday in Seattle and Tacoma before being released elsewhere in the country. Go to scheduled screenings. It’s a beautiful film, both for its stunning photography and for its careful portrayal of the characters and situations taking place in Nootka Sound, near the northern end of Vancouver Island. Somehow, the 2-year-old killer whale became separated from his family and began living a solitary life, seeking attention from humans. It was not easy to balance the varying viewpoints. Believe me, I know because I struggled with these issues while covering the same story for the Kitsap Sun — from the time Luna first arrived in Nootka Sound until the day he died there. I served as the only pool reporter for U.S. print media during an unsuccessful attempt to capture Luna and return him to his family. But I’ve talked about this before. See Water Ways entries from July 5 of this year and Aug. 6 of last year, which includes links to my stories. I was pleasantly surprised when I watched “The Whale” yesterday to learn that filmmakers Michael Parfit and Suzanne Chisholm did not attempt to create heroes and villains in this story. They played it straight, balancing the various opinions regarding how Luna should be managed, if that was even possible. An unusual angle to the story was the spiritual beliefs of the Mowachaht-Muchalaht band of First Nations people, who held the view that Luna was the embodied spirit of their late chief who had died the week before Luna arrived in Nootka Sound. Marine mammal biologist Toni Frohoff says in the film that things usually end badly for marine mammals who become habituated to humans. But, with no family around, Luna was the one who initiated contact. Most people who met Luna were convinced that he needed attention. Some chose to follow official orders and ignore him; others petted and played with him. Were these interactions for the gratification of the people who wanted to touch a whale? Did they help this lonely orca? Or was there some mutual benefit from interspecies relations? That is the question left dangling. Kari Koski of SoundWatch, based in the San Juan Islands, traveled to Nootka Sound to discourage people from interacting with Luna. As a “steward,” she has had far more success with people around killer whales in Puget Sound, where the orca families are large; they stay together; and they don’t usually seek human contact. More than a year after the rescue attempt failed, Mike began to interact with Luna. This he admits, though his actions were contrary to official orders from the Canadian government. He had followed the rules while trying unsuccessfully to change those policies. Mike says he adopted a goal of leading Luna away from dangerous situations, including a log dump where the young whale could be hit and killed by a falling log. But Luna’s death came anyway, four years after his arrival, when he was sucked into the propellor of a powerful tugboat. Seattle filmmaker Michael Harris, known for his wildlife films in Puget Sound, says he will not watch “The Whale” and discourages other people from doing so. His reasons are varied, but he worries that the film will give people the idea that it is OK to interact with killer whales, something that increases the risk of their being injured or killed. I have not heard this complaint from others, but I would welcome comments from people who have such concerns. 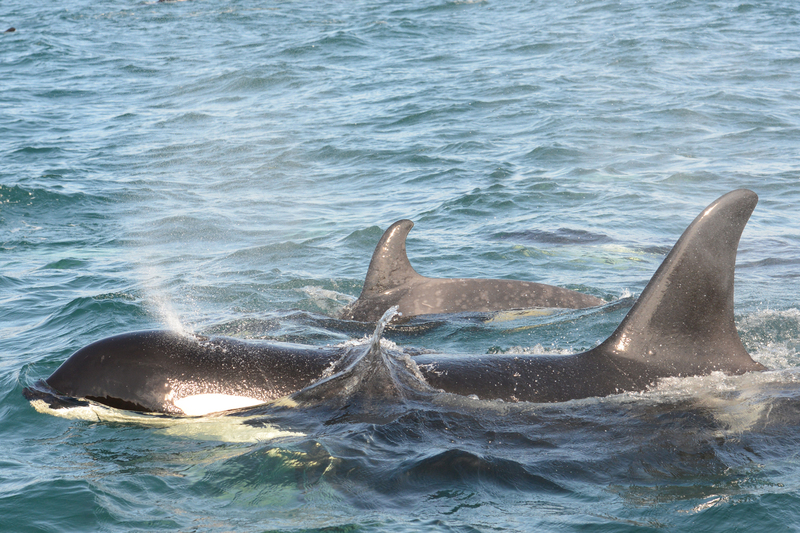 Michael points out that the story was different for Springer, a young female orca from the Northern Resident community of Canada who was found hanging out in the ferry lane between Vashon Island and West Seattle. It was at the same time that Luna was up north in Canada. Interaction with Springer was discouraged, and U.S. officials moved quickly to capture her and take her back to her family near the north end of Vancouver Island. This year, marks the 10th anniversary of Springer’s reunion with her family, and Springer appears to be doing great, according to observers. Springer’s successful reunion is not mentioned in the movie “The Whale,” but the management of her plight must be remembered as a success story. Luna’s story, on the other hand, has no happy ending, but it does help us understand the ways of killer whales, particularly those left alone for a long time. I hope “The Whale” will help us humans find better ways to handle things next time. For more info, go to “The Whale” website. The cinematic story of Luna, the killer whale, is undergoing a Hollywood makeover before its official release in U.S. theaters a few months from now. The original documentary, “Saving Luna,” won numerous awards at independent film festivals across the U.S. and Canada and even overseas, but the film has never been widely released in U.S. theaters or made available on DVD. The new version shifts away from some of the politics at the time, which involved how Luna should be treated and whether he should be captured in Nootka Sound on Vancouver Island and brought back to Puget Sound. Apparently, the new focus heightens the theme of friendship between Luna and local residents of Nootka Sound, where he suddenly appeared one day in the summer of 2001. Luna’s story is one I chronicled for the Kitsap Sun over a period of several years. In fact, I was the first reporter to break the news that the two-year-old killer whale had been spotted in Nootka Sound after being separated from his Puget Sound family and presumed dead. Amazingly, this was at the same time that another young killer whale — Springer, whose family lived Northern British Columbia— was found alone and swimming in the ferry lane between Seattle and Vashon Island.